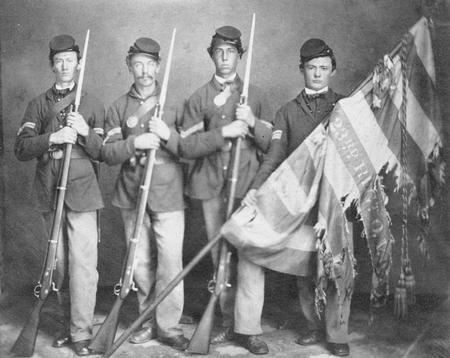 Color guard of the 23rd Ohio Volunteer Infantry with the national colors of their regiment, ca. 1863-1865. The regiment, composed of soldiers from Ohio, mustered in for Civil War service with the Union Army on June 11, 1861 at Camp Chase, Franklin County, Ohio. They mustered out on July 26, 1865 at Cumberland, Maryland. The American Civil War was one of the greatest conflicts in American history. The war began on April 12, 1861, with the Battle of Fort Sumter in Charleston, South Carolina. The conflict resulted from tensions between the North and the South, principally over the issues of slavery and its expansion, state's rights, and regional economic competition. Since 1820, Northerners and Southerners attempted to politically compromise on these questions. Each side entered into various agreements, including the Missouri Compromise, the Compromise of 1850, and the Kansas-Nebraska Act. While each of these compromises sought to ease tensions, none of them fully solved the problems, namely the slavery issue, that existed between the two regions. Throughout the 1850s, tensions between the North and the South escalated with violent confrontations. This was especially evident in "Bleeding Kansas." Some Northerners became convinced that Southerners unfairly dominated the legal system in the court case of Dred Scott v. Sandford (1856), which held that slaves were property and not citizens. John Brown's raid on Harper's Ferry in 1859 raised tensions further, as Brown hoped to seize the federal arsenal at Harper's Ferry in what is now West Virginia to arm the slaves in the South. The raid failed, and Brown was executed. Finally, the election of Abraham Lincoln, a member of the Republican Party, in November 1860 as president convinced many Southerners that slavery soon would end within the United States. Eleven Southern states seceded from the Union between December 1860 and June 1861, creating the Confederate States of America and beginning the American Civil War. During the war's first year, events went poorly for the Union. The Union lost the Battle of First Bull Run in June 1861, convincing many people that this conflict might be a long one. In 1862, the Union again faced numerous setbacks in the East. General George McClellan's Peninsular Campaign was a failure. General Robert E. Lee's Army of Northern Virginia launched its first invasion of the Union, only to be turned back by McClellan's Army of the Potomac at the Battle of Antietam on September 17, 1862. The Union military experienced more success in the West. Under General Ulysses S. Grant, Union soldiers captured Forts Henry and Donelson. They effectively drove Confederate forces from Kentucky and much of Tennessee, especially after the Battle of Shiloh in April 1862. In late 1862, President Lincoln issued the Emancipation Proclamation. This document declared that all slaves in areas still in rebellion as of January 1, 1863, would receive their freedom. The president had now made the ending of slavery one of the Union's war aims. Events continued to improve for the Union during 1863. In the East, after an early defeat at the Battle of Chancellorsville, the Union's Army of the Potomac defeated the Army of Northern Virginia during its second invasion of the Union at the Battle of Gettysburg. In the West, Grant captured Vicksburg, Mississippi, the last major stronghold of the Confederacy along the Mississippi River. This victory gave the Union control of the Mississippi River, effectively dividing the Confederacy in two. Grant followed up this victory with another at the Battle of Chattanooga, freeing much of Tennessee from Confederate control. During 1864, Grant assumed command of all Union forces. During the first three years of the war in the East, Union armies had repeatedly tried to capture the Confederate capital of Richmond, Virginia. Grant determined that Richmond was unimportant. To win the war, he believed that the Union military had to defeat the Confederate military and force it to surrender. Rather than trying to capture Richmond, Grant attempted to conquer the Army of Northern Virginia. Grant lost more men than the Confederates at battles like the Wilderness, Spotsylvania Court House, and Cold Harbor. Nevertheless, he repeatedly attacked, refusing to retreat like earlier Union armies had done. Grant realized that the Union had many more men available for duty. He could much more easily replace his wounded and dead, eventually forcing Lee to surrender his dwindling Army of Northern Virginia. Grant's strategy was successful, and Lee surrendered on April 9, 1865. In the West during 1864, Grant delegated command to a trusted subordinate, William Tecumseh Sherman. Sherman captured Atlanta, Georgia, in the fall of 1864, and then embarked upon his "March to the Sea." Sherman and his army marched from Atlanta to Savannah, Georgia, making war against both the Confederate military and the civilian population. Sherman decided that the Union also had to break the will of the civilian population to win the war. This approach later came to be called "total war." In 1865, Sherman advanced into North Carolina and South Carolina, continuing his campaign against the Confederate armies and local civilians. Ohioans played an important role in the war effort. During the American Civil War, the State of Ohio provided the United States government with three types of military units: artillery units, cavalry units, and infantry units. Ohio supplied the federal government with more than 260 regiments of men; not counting several companies that formed the basis of regiments in West Virginia, Kentucky, and Massachusetts. A total of 310,654 Ohioans served in the Union army for varying lengths of time. The federal government required each state to supply a set number of soldiers determined by the state's population. Ohio exceeded the government's call for men by 4,332 soldiers. This number does not reflect the 6,479 men who paid a monetary fine to the government to escape military duty. It also does not include the 5,092 African-American soldiers who served in the United States Colored Troops or in units from other states, including the famous Fifty-Fourth and Fifty-Fifth Massachusetts Infantry Regiments. Ohio exceeded the federal government's requirements by more than fifteen thousand men. Ohio men fought in every major battle of the war. Within forty-eight hours of President Abraham Lincoln's call for volunteers in April 1861, two Ohio infantry regiments already had departed for Washington, DC. An Ohio brigade protected the Union army's retreat at the Battle of First Bull Run in 1861. Ohio regiments also helped secure Kentucky and West Virginia for the North. They participated in the Battles of Fort Donelson, Fort Henry, Gettysburg, Antietam, Fort Wagner, Shiloh, Chickamauga, Chattanooga, and many others. Approximately 11,237 Ohio soldiers died from wounds received on the various battlefields, while another 13,354 men perished from diseases. Eighty-four of every one thousand Ohio men who served died in the war. Another forty-four for every one thousand deserted. This was one of the lowest desertion rates in the Union states. Ohioans were divided over the war. Most Ohioans supported the nation's reunification, but some, known as Copperheads, vehemently opposed the war. Clement Vallandigham, a well-known Peace Democrat, came from Ohio. There were several reasons why these people did not support the Union war effort. A sizable number of white Ohioans, especially those living along the Ohio River, had migrated to the state from slave holding states. While opponents of the war could not legally own slaves in Ohio, many of them had family members residing in the Confederacy who did own African American slaves. These people often sympathized with slaveholders, agreeing with many white Southerners that the federal government did not have the power to limit slavery's existence. Despite the divided sentiments within Ohio regarding the war, Ohioans still contributed greatly to the Union victory. A number of prominent generals, including Irvin McDowell, Don Carlos Buell, Philip Sheridan, George McClellan, William T. Sherman, and Ulysses S. Grant, all came from Ohio. The Civil War also was an opportunity for several Ohioans to make a name for themselves and to use their fame to gain political power. Following the war, Ohio veterans Ulysses S. Grant, Rutherford B. Hayes, James Garfield, and William McKinley all were elected to the presidency of the United States.